Yesterday, news reports revealed that the DNA testing company 23andMe got the 21st-century regulatory version of that tagline: it’s not nice to fool with the FDA. Now let’s stop here for a minute. The Legal Genealogist wants to be crystal clear about this. The FDA doesn’t care a whit about purely genetic genealogy. It’s not interested in the Family Finder test or the YDNA or mtDNA tests offered by Family Tree DNA. It doesn’t care how much Scandinavian ancestry shows up in my test report from AncestryDNA. It doesn’t even care about my genealogy results at 23andMe. It only cares about genetic tests that provide health data. So why is the FDA going after 23andMe? Because of statements like this: “Testing with 23andMe can tell you hundreds of things about your health.”4 Or the old headline from its website: “23andMe can help you manage risk and make informed decisions.”5 And like the one illustrating this post that I screen-captured from my own 23andMe results this morning, telling me about “health recommendations” the company had for me. So let’s see what we have here. A company that agrees that “FDA clearance is an important step,” that actually files applications for FDA approval, that gets input from FDA as to what FDA wants — and then — at least according to the FDA — turns around and ignores the FDA for six months. So… what does this mean for us, as genealogists, and particularly those of us who — as genealogists — have tested with 23andMe? First and foremost, it isn’t likely that the FDA is actually going to shut down 23andMe in the next 15 days. The letter appears to have done exactly what I expect the FDA intended it to do: get the attention of the decision-makers at 23andMe. In the usual case, a company that’s cooperating with the FDA is allowed to continue operations and there’s no reason to think that won’t be the case here. Second, the FDA isn’t going to start regulating purely genetic genealogy: the ancestry side of the 23andMe test results are not at issue in the FDA letter, though the 23andMe business model is such that it isn’t likely it could stay afloat if it had to rely only on its genealogy customers. But so… what does this mean for us who — as people — have tested with 23andMe and who may be interested in those health results? His story had a personal happy ending — he didn’t have the exact mutation that causes that dystrophy but rather two separate mutations on two different genes, and that combination doesn’t cause the dystrophy. I’m sitting here with my popcorn, waiting for the next installment of threading the needle, FDA-style. It’s nice to see some coherent thoughts on this subject. So many comments on various sites have ranged from the terse (“FDA sux!”) to the illogical (the FDA is not always correct, therefore it is always wrong) to the conspiracy-minded (“They’ll have to pry my DNA from my cold dead hands!”). Now I don’t doubt for a second that the FDA is influenced by outside interests, but that doesn’t imply that this application of the regulatory brakes is a bad thing. There’s an awful lot of grey in this field, Ruy: black-and-white conclusions are usually going to be wrong! My opinion doesn’t matter because I have no power, however, a recommendation is not a diagnosis, no matter how strong. Health recommendations are made every day through advertising, whether exercise equipment, organic foods, blenders, grills, weathermen announcing bad allergy days and recommending that people stay indoors, and online websites that offer medical advice. This is basically a matter of truth in advertising: if you sell me my data, no issue. If you tell me my data means that I have X, you need to be right. The very real problem here is that 23andMe’s medical genetic tests have no demonstrated validity. It isn’t simply that the FDA is implementing its oversight on 23andMe, or that 23andMe has not responded in a timely manner to the FDA’s demands, but that 23andMe may be selling snake oil because its clinical tests do not meet accepted medical standards. As the FDA letter says, the “FDA is concerned about the public health consequences of inaccurate results from the PGS device”. Because the FDA “do[es] not have any assurance that the firm has analytically or clinically validated the PGS”, “serious concerns are raised if test results are not adequately understood by patients or if incorrect test results are reported.” Thus, whether the lay public should have access to medical tests without medical provider oversight is only a side issue here. Whether the public should be sold a bill of goods is the real issue. It’s not even a side issue. The FDA won’t stop you from buying a test that gives you your entire genome in terms of raw data. Its oversight is strictly on the interpretation of the data. Yes, that’s what the FDA is saying – 23andMe’s interpretation of the data does not meet medical standards, thus making marketing and sale of the test harmful to consumers. Just to be precise: the FDA is only saying 23andMe hasn’t shown that it meets standards, not that it actually doesn’t meet standards. Pleas let me recommend to those who haven’t read it the book “The Language of Life: DNA and the Revolution in Personalized Medicine” by Francis S. Collins. he is the director of the National Institute of Health and spent 15 years as director of the National Human Genome Research. The book was published in 2010. I guess I shouldn’t be surprised, but I am, at the misinformation being espoused by medical professionals and even genetic counselors using the worst case scenarios and making it sound as if the only people who should have access to medically relevant information are trained professionals. Well the last time I checked your “not so well trained in delivering bad news doctor ” is the one to say sorry you’ve got cancer of the X. And most of the time the diagnosis is correct, but sometimes its wrong. The world is a complex place with lots of scary stuff. But we do not live in the same world as we did 50 years ago. Its no longer Father knows best. There’s lots of places where I am not thrilled with 23andme and if it is engaging in false advertising than fine curtail it. But I see the information as provided by 23andme to be interesting, sometimes useful and sometimes potentially life saving. The additional resources they provide are far better and more empowering than that which accompanies most doctor’s diagnoses. I actually am more concerned about their downsizing their chip and making it impossible to compare old and new information in a meaningful way. And the fact that I have my family their. So it may be time to take advantage of the FTDNA sale for $49 uploads! apologies for the many typos and spelling errors. Arrrgggh! Fingers ahead if brain with Ipad! I’ve never been a fan of the “only the doctor can tell you X” school. But I’m a BIG fan of the “don’t tell me X if X isn’t true” school. I hope the FDA is focusing only on the latter and not on the former. Time will tell how this plays out. Thank you very much for your clear and rational discussion of this issue. Almost all of the coverage of this story has been FDA-bashing by people who have no clue of how FDA operates and what the legal requirements are. They also have no idea of how seriously FDA takes even the slightest hint of conflict of interest issues or that FDA employees have been fired or jailed for “outside influence” as blithely alleged by Ruy Cardoso. Bashing bureaucrats is one of the great remaining American sports, along with tax evasion. I’m sorry if I came across as glib, Retired FDAer — I was referring to more subtle political pressures that any organization is subject to, not something as nefarious as I inadvertently made it sound. Appreciate the clarification – you’re probably the only commenter out there being that subtle. Well, I’m a member of 23andme.. I never knew I was a carrier of the CF gene Delta F508 before I got my results there. You all are right – we must stop people from informing others about genetic predispositions like this! The FDA isn’t saying don’t tell people. It’s saying, show us that what you’re telling people is true. I don’t understand the problem. The FDA and 23andme have been discussing/disputing since at least 2010, and the FDA agent responsible for the letter, Gutierrez, has admitted that the problem isn’t that the tests 23andme offer are wrong. Most involved seem to believe that the tests do what they say, provide analysis on conditions that correlate with certain genetic patterns. The question Gutierrez raises is if 23andme has the right to provide information about those correlations, or at least if it may provide that information without the oversight of a doctor or genetic counselor. Its a matter of a court to decide the 1st amendment issues. But the medical community seems to support 23andme, though (http://slatestarcodex.com/2013/11/26/a-letter-i-will-probably-send-to-the-fda/). That’s one slant on the issue. A breakdown in communications is what seems to be at the heart of things here. What will happen in the near future when there devices like the mini-ION are affordable and easy to obtain; when anyone can sequence their own DNA using something they can plug into their tablet or phone, and then use something like a future version of Promethease to assess their own genetic risk profile? If 23andme merely sold the spit kit and provided customers with a link to SNPedia, would their product suddenly not be a medical device? Imagine a company that sold a device that you could use at home to obtain biometric data about yourself; data which could then be used to derive a comprehensive profile of your own personal disease risks. Doesn’t a scale do that? Is a scale a medical device because you can use it to obtain your body weight, and thus, your BMI (to determine whether or not you are morbidly obese, along with the associated disease risks)? Whether you like it or not, knowing the ~3 billion base pairs that comprise your genome will someday be as trivial as known your own body weight; and utilization of the ever-increasing wealth of GWAS data will be as trivial as using a BMI calculator. And all the hand-wringing about the regulation of “medical devices” will seem so quaint and naive. I’m sure the future will be full of all kinds of things we can’t imagine now. But I would hope accurate information is always in the forefront. Thanks for a clear and informative analysis of the issues between 23andMe and FDA. As a Regulatory Affairs Professional employed by a public company (I am not a Regulator), these issues are of great interest to me. Best regards, and many thanks. Thanks for the amendment, Steve. Very much appreciate your input. Does “stop marketing” mean they can’t take orders or process samples? Exactly what will and won’t be allowed — if there’s any real service interruption at all, now that 23andMe has resumed working with the FDA to answer its questions — remains to be seen. 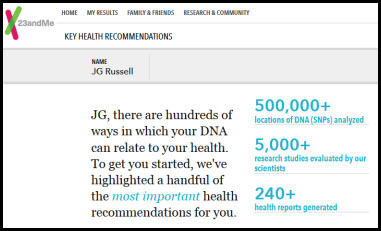 My guess is, if there’s any impact at all, it will be exclusively on providing health info, not on taking orders or processing samples or providing match info on the ancestry side.